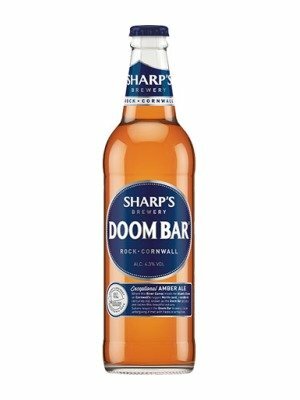 Sharps Doom Bar is a popular Ale available from Tesco Groceries in 50cl to buy online. Visit Tesco Groceries for the best price for 50cl of Sharps Doom Bar or compare prices on our other Ale products. Sharps Brewery (in Rock, Cornwall) have been creating great beers since 1994 and their flagship Doom Bar is a glorious beer the way it should be. Since reaching the public the beer has become the Number One selling cask ale up and down the country. With no less than Seven major awards the beer is slightly transparent with an amber colour, it has a sweet malt taste with bread notes. Where to buy Sharps Doom Bar ? Sharps Doom Bar Supermarkets & Stockists. You can buy Sharps Doom Bar online in most retailers and find it in the Ale aisle in supermarkets but we found the best deals online for Sharps Doom Bar in Tesco Groceries, DrinkSupermarket.com, and others. Compare the current price of Sharps Doom Bar in 50cl size in the table of offers below. Simply click on the button to order Sharps Doom Bar online now.